It’s a whole new ballgame with R.B.I. Baseball 18! R.B.I. 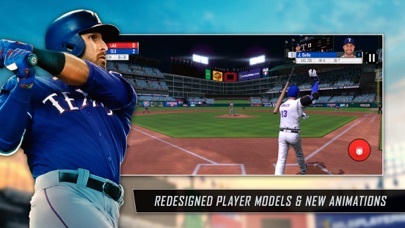 18 takes a significant leap delivering all-new Franchise Mode, brand new detailed player models, hundreds of new animations, high fidelity MLB ballparks, revamped crowd system, more dynamic camera angles and a stunning UI presentation. 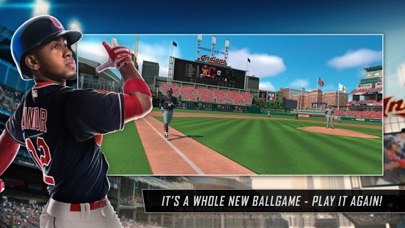 This MLB season get the baseball game that will have you wanting to PLAY IT AGAIN! 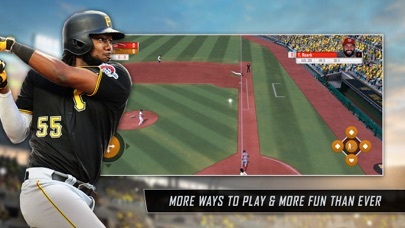 All-New Franchise Mode: Take control of your favorite MLB team! Make trades, pick up free agents or call up rookies through multiple seasons. Authentic MLB Players: Completely redesigned player models, hundreds of new animations including unique player-specific animations bring a whole new look and feel. 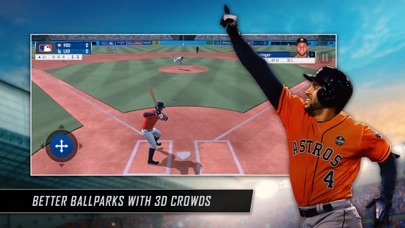 Better Ballparks: Experience enhanced lighting, textures, revamped 3-D crowd system and new dynamic camera angles in all 30 MLB ballparks. 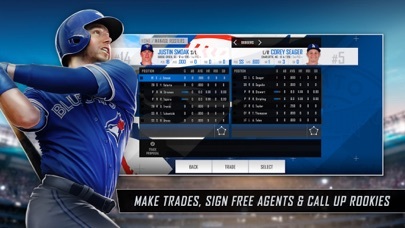 MLB Legends: Play as the greats with over 100 historic players Roster Updates: Get the latest rosters throughout the 2018 season and use the new Import Rosters feature to keep your in-progress Franchise current without starting over! **NOTE FOR DEVICES UNDER 2GB** Both Franchise and Postseason modes require at least 2GB of device RAM. Other features including exhibition mode will be playable on your device. We have optimizations in development to better support these devices in the future. © 2018 MLB.com MLB Advanced Media, L.P. All Major League Baseball trademarks, service marks and copyrights used herein are the property of the applicable MLB entity. All rights reserved. OFFICIALLY LICENSED PRODUCT OF MAJOR LEAGUE BASEBALL PLAYERS ASSOCIATION-MLBPA trademarks and copyrighted works, including the MLBPA logo, and other intellectual property rights are owned and/or held by MLBPA and may not be used without MLBPA’s written consent. Visit www.MLBPLAYERS.com, the Players Choice on the web. I love this game!! This game lets me hit homeruns. It should be improved with updated graphics, rosters, actual franchise mode and have a way to improve graphics even the crowd looks like it’s from ‘98-00. Beef up that and hire/fire staff. Have a budget for the team you have in franchise mode. App does not support use on iPod. Unable to get refund after owning less than 24 hours. Poor customer service. Every batted ball is always hit right at someone. Performance is also horrible, the FPS drops and stutters are horrendous. The Show style franchise mode and roster customization, but no ability to create a player. Who would want to play ten seasons in this game? A total waste of $5. A little confusing at first but eventually it becomes super fun!!!!! Love the game always get on grand slam love it !!!!!!!! !